Inder Loves Folk Art: An Easter - no, make that "Vernal" - Geranium. An Easter - no, make that "Vernal" - Geranium. Oh, my sweet Miss Margaret Joy! 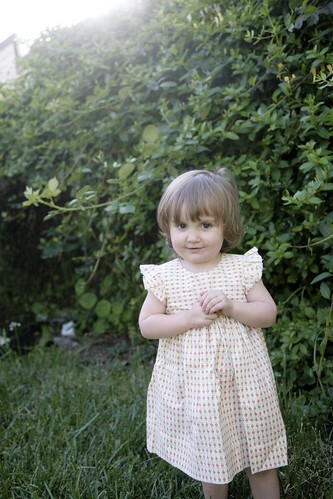 Since I last blogged a Maggie dress, she got her first haircut! A cute almost bowl-like bob. I held out for a while, but Maggie's long hair was getting a bit straggly and she never lets me put it back in a ponytail or barrette ... or comb it ... so finally I decided we'd all be happier with a cute short cut. I didn't mean for it to be quite so bowl-like, but with kid haircuts you just pretty much get what you get - the style of the haircut is determined by how long your child will sit still and how much they are hating the process. Which for my kids is quite a lot (of dislike, that is). We went to a local place called "Queenie's," walking distance from our house, where all of the hairdressers and customers were speaking Cantonese. I was skeptical of a place that advertises $7 cuts and doesn't specialize in kids, but Steve told me they did a nice job with Joe, and he was so right! Queenie herself fussed over Maggie and was so sweet and patient with both Joe and Maggie while they were enduring their haircuts, and then gave them tamarind lollypops as a reward! They were pretty thrilled by that. Here's an action shot for your amusement. Look at that face. That is Maggie's "I'm putting up with this right now, but make no mistake, I am NOT ENJOYING IT" face. My hand firmly on her shoulder and around her neck? Necessary in order that she not get poked with scissors. Sorry babes. Of course, Maggie would be adorable with any type of hair, but look how her new bangs frame her pretty brown eyes! Of course she wakes up with it looking pretty much this adorable. I don't know how she does it - I wish I had this problem! This girl's hair naturally falls into a default mode of "artfully unkempt hipster." Onto the dress. This was intended to be an Easter dress, and was finished in plenty of time, but then, alas, Maggie came down with a fever right before Easter and couldn't participate in the festivities. Joe and I went to the egg hunt on our own, and this dress sat until last weekend, when I finally pulled it out and asked Maggie if she'd like to try it on and take pictures. Thankfully, she said "I like it!" and readily agreed to my plan. 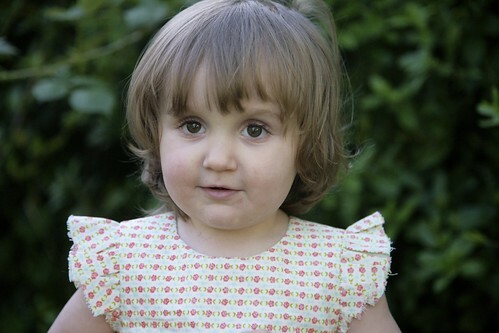 Of course, this is the well known and rightfully popular Geranium Dress by Rae, in size 18 months, with a plain neckline, gathered skirt, flutter sleeves, and no pockets. I used a pretty calico I bought at A Verb For Keeping Warm, a small Oakland shop with a lovely selection of quality yarns and a beautifully curated selection of fabrics (including Liberty, Nani Iro, and gorgeous linens as well as some quilting cottons like this one). I liked that while it has pink flowers (sure to please Maggie), it has lots of yellowy cream and spring green and doesn't read predominantly pink (which pleases me). It has a stripey (wallpaper-like) floral motif, and I ran the stripes horizontally on the bodice and vertically on the skirt. I wanted to "fancy" the dress up a bit for Easter, so, inspired by this version, I embellished the waistline with a simple spring green grosgrain ribbon and sewed a little bow on the front. I sewed the ribbon on with pick stitches before whip stitching the lining down by hand (thus hiding my ribbon stitches inside the bodice). The back closes up with green buttons (maybe they could've been placed better, shrug). 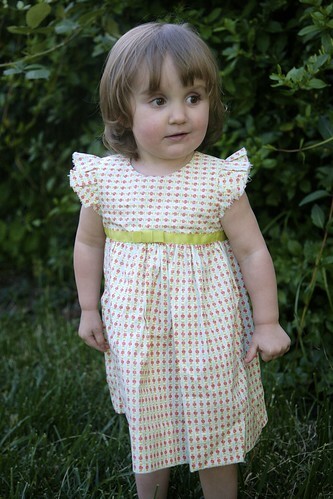 The size of the dress is just right for petite Maggie, with no growing-into required. I finished the flutter sleeves with a simple zig-zag and they have a charmingly raggedy look. I lengthened the skirt pattern pieces by a few inches and then turned over and handstitched a 3 inch deep hem. The skirt ended up a bit shorter than the pattern is drafted for (it just clears Maggie's knees). 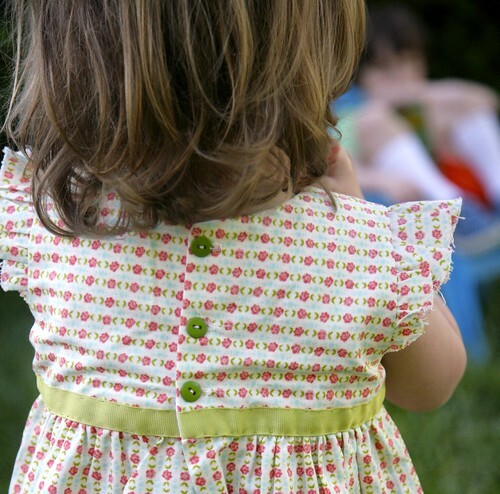 I love a deep hem on little girls' dresses. It has an old-fashioned look to me. 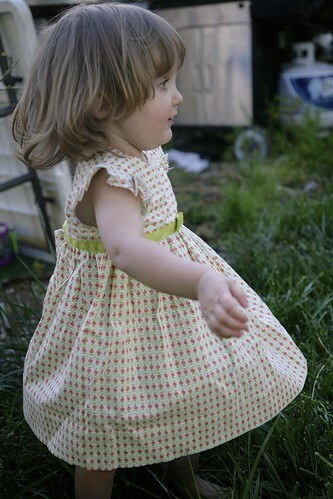 Traditionally, I think such a deep hem was done with an eye to letting the dress out as the child grew, but as Rachel and Alicia Paulson have both recently mentioned, a deep hem also adds weight and substance to the hem that help a gathered skirt to hang better. 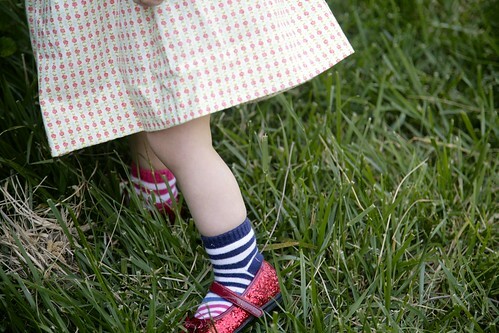 As you can probably guess, Maggie chose her own hosiery and footwear for this photo shoot. 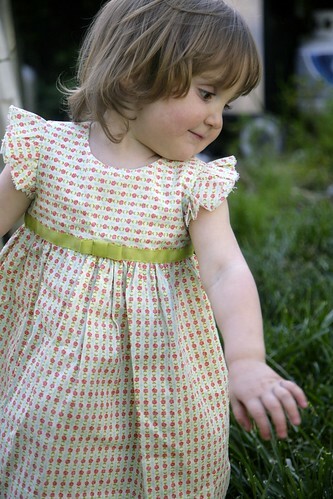 Initially I was a little disappointed that Maggie didn't get a chance to wear this on Easter (and, let's face it, be photographed in it holding an Easter basket), and after all that hand-stitching, I wasn't sure how much wear it would see, but do you want to know the best part about this dress? She loves it! Look at her testing the "twirl"! She actually wore this dress two days in a row, and I had to convince her to take it off on the third day. So I think it will get plenty of love, and there is no better feeling for me than making something that my kids love! Oh my sweet girl. It's lovely. 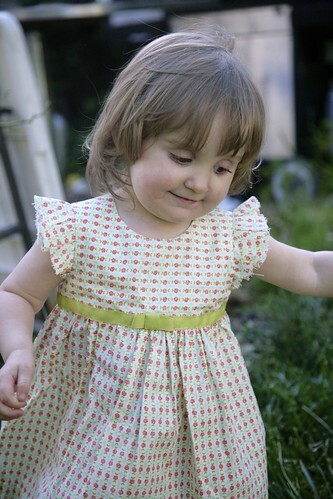 The fabric is sweet and I think the deep hem does add some charm to the dress. I need to do that more often. 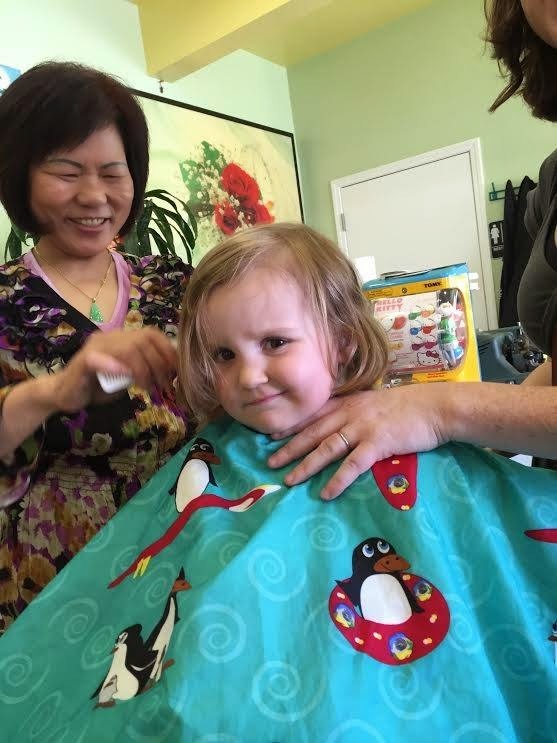 Her face in the haircut picture is priceless. Oh she is too sweet! It was meant to be, Inder! That haircut is amazing! I love it. The dress is perfection! It all has such an awesome 70s vibe. And those photos! Just icing on the cake! Unwilling to take it off? Now that's a compliment! Oh so sweet! Her little eyes and curls. And the geranium dress just has such a nice fit, doesn't it. I love the idea of adding an extra-big hem. I'm have to try that out one of these days. Ohmagersh, that haircut is impossibly sweet! I just want to reach through my screen and squeeze those cheeks. I love how this dress turned out! 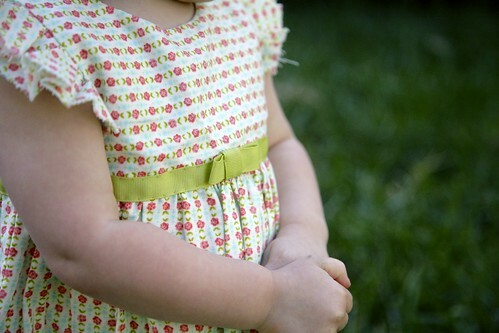 The fabric is so sweet and the ribbon trim is such a great touch. I'm so glad she loves it. Her new haircut is adorable-- you're right that any hairstyle would be cute on her. She's got those rosy Campbell's soup kids cheeks that are just precious! love that haircut! Both the during and after photos are gorgeous. Very pretty dress and doesn't it feel like a lottery win when they like it as much as you do! Noodlehead Divided Basket and misc.